Most of the vaccinations, especially live vaccines are harmful in pregnancy and just preconceptionally. 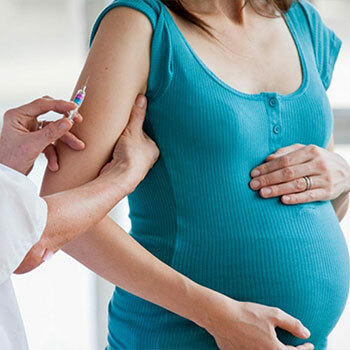 Tetanus toxoid is a vaccine that has been widely used in developing countries and in India to prevent tetanus infection in the mother and the newborn. The usual dosage is 0.5ml intramuscular at 16 weeks and 20 weeks of pregnancy. There are hardly any side effects other than slight swelling and pain at the injection site for a few days. The other vaccine which is known to be safe in pregnancy and is given world-wide during influenza epidemic. Vaccinations for chicken pox, rubella, human pappiloma virus (HPV-cervical cancer vaccine) should be avoided during pregnancy and ideally in the 3 months prior to conceptions. Prior to pregnancy women who take preconceptional advice may be offered a check of their immunity against rubella, varicella and Hepatitis B. If immunity is not present, they may be offered protective vaccination. If preconceptional vaccines are offered, couple should not conceive in he next 2-3 months-depending on the vaccine taken. Professional help should be sought for pregnancy planning.